Three of Sir Josslyn Gore-Booth’s four sons fought in World War II, Hugh, Brian and Angus. Two died (Hugh and Brian), and one returned traumatised (Angus), and spent much of his life smoking Russian cigarettes in the kitchen off the Bow Room in Lissadell. It took us three weeks just to clean the ceiling. Sir Josslyn’s eldest son and heir, Sir Michael Saville Gore-Booth was mentally disabled, and spent most of his life in a nursing home in Yorkshire. 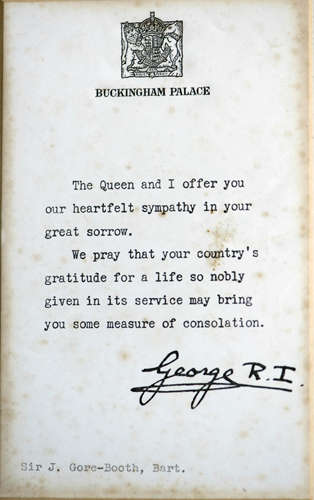 Like many Anglo-Irish families, the Gore-Booths felt a primary loyalty to Britain. 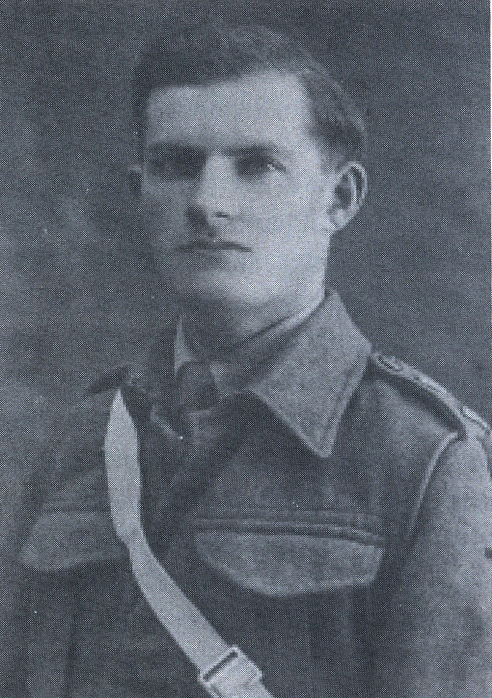 During the First World War, Sir Josslyn had established a munitions factory at Lissadell, and made several public addresses calling for Irish men to join the war effort. In WWII he made that call good, and sacrificed his own sons. 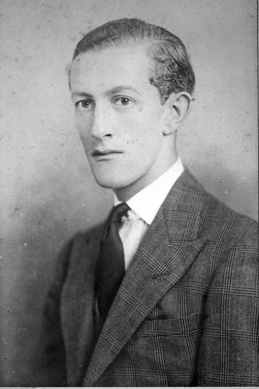 It was a sad day for Lissadell, and for Brian’s father, Sir Josslyn Gore-Booth, when Brian died. 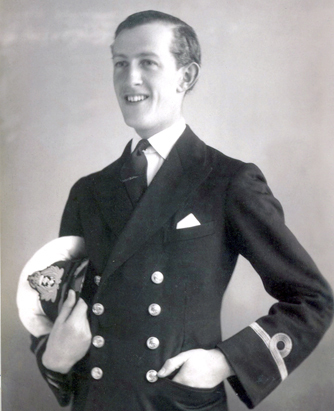 Three years later, Brian’s brother, Hugh, was killed in November 1943 in an offensive on the Greek island of Leros, off Crete. A week later he was reported missing, but was not confirmed dead until March 1944. On hearing the confirmation of Hugh’s death Josslyn was heartbroken, and died within a few days. “It is Christmas Day and I am at sea – a wonderful day with marvelous lights in the sky at dawn, and one of the most beautiful sunsets I have ever seen. I suppose to everyone engaged in war, today seems rather a mockery – to talk of peace and good-will towards all men when one is engaged on a mission of destruction. But still the old spirit, the best of Christmas spirit, has done us all good. For a few hours frayed nerves have been put aside, and differences of rank forgotten. …It has really been a happy day.. the first lieutenant dressed as Father Christmas – we visited the sailors to give them a share in the goodies you and the others had sent us. Now it is evening and we are bound for home. Our captain has been awarded the DSO) for our part in recent operations. I can tell you nothing more”. 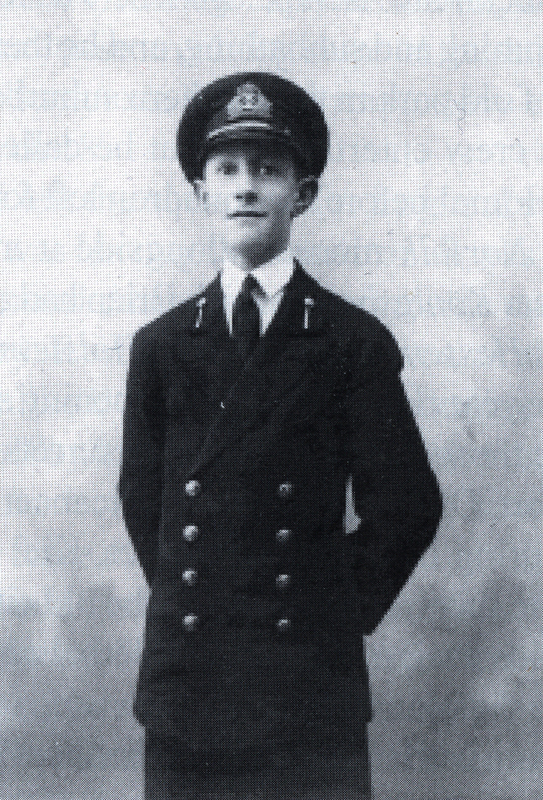 On Tuesday 23 January 1940 a telegram from the Admiralty arrived at Lissadell: “Admiralty deeply regret to inform you that your son, Sub-Lieut. 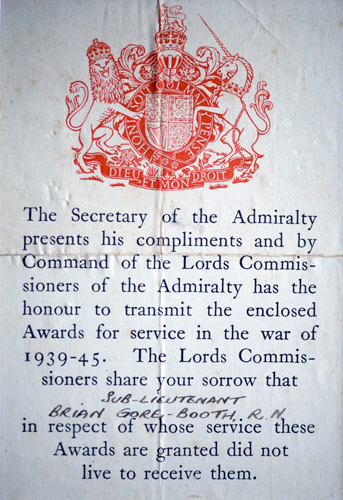 Brian Gore-Booth is believed to have been on board HMS Exmouth and is therefore regarded as missing presumed dead”. “The Secretary of the Admiralty regrets to announce that HMS Destroyer, Exmouth (Captain RS Benson) has been sunk by mine or torpedo and it is feared that there are no survivors”. The destroyer “was lost with all hands in position 58.18 N, 02.25 W in the Outer Moray Firth”. 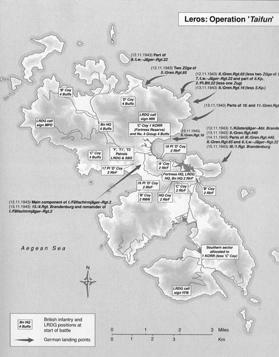 It had been ordered to hunt for a U-boat known to be in the area, but at 05.35 was torpedoed (as it later transpired), by U 22, commanded by Kapitanleutnant Karl Heinrich Jenisch. Only a lifebuoy and some floating debris were found. 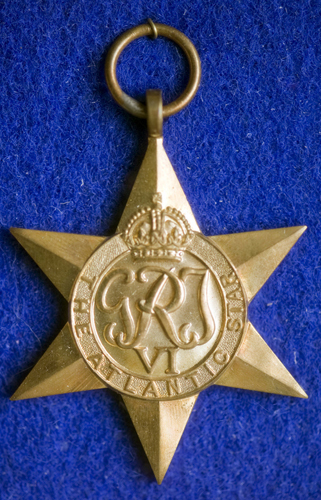 Six days after the Exmouth went down, the Irish Times reported that 15 bodies from the vessel had been washed ashore on the northeast coast of Scotland, and had been buried together with military honours. 11 of the victims had been identified; three more bodies were washed ashore on the day of the funeral. 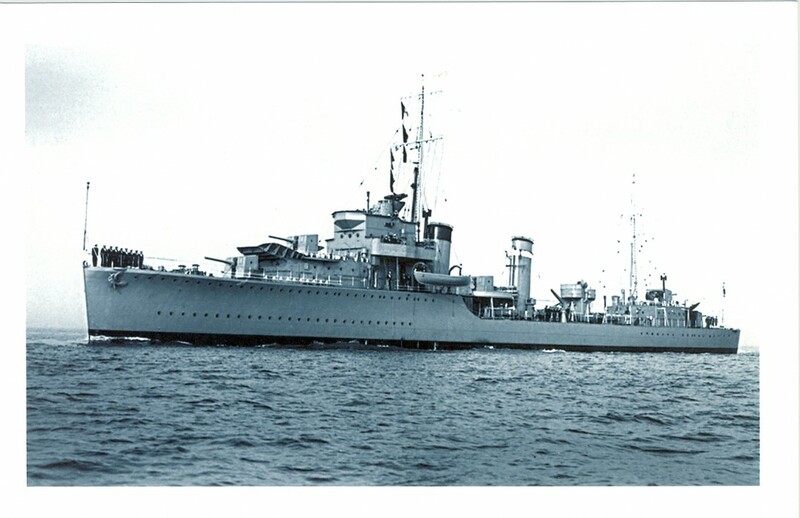 “These unarmoured vessels with nearly two hundred men on board became, as Grenville and Exmouth have shown, a prize and a target for a U-boat in themselves…. 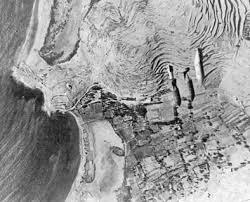 It is unsound to place so large a human stake in an unarmoured, highly vulnerable vessel…”. 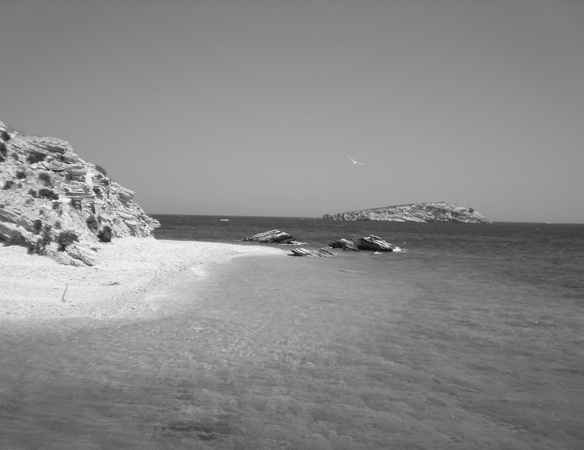 The wreck was discovered in 2001 and from this point a families association was formed. A number of memorial events have taken place culminating in having a plaque placed in the Wick St Fergus Church of Scotland in the North East of Scotland. NB: the ship lies 22 miles off the coast of Wick in the Moray Firth.The memorial plaque displays the 189 names of the crew. 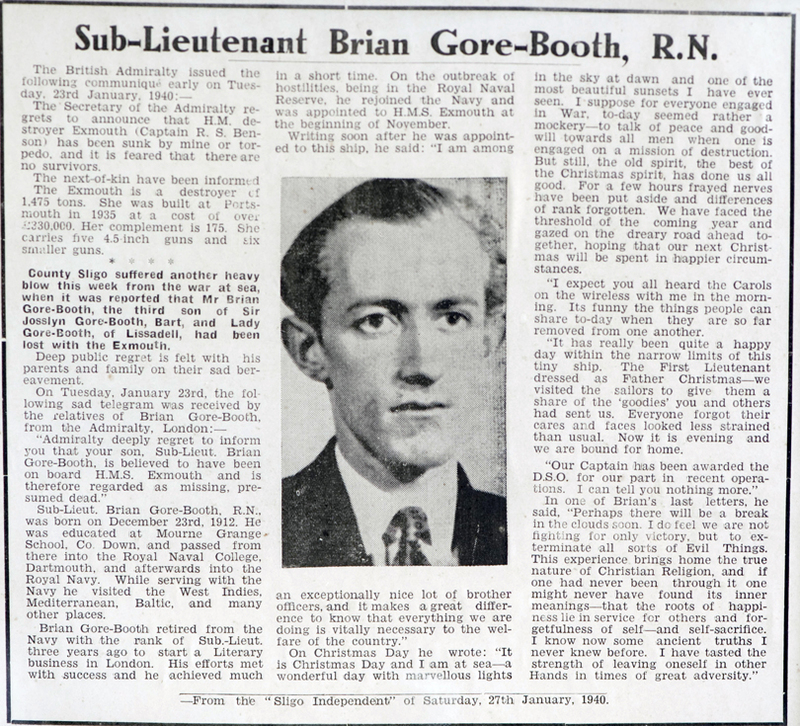 For more information on Brian + Hugh, see Dermot James‘ excellent biography “The Gore-Booths of Lissadell”, published by the Woodfield Press in 2004. 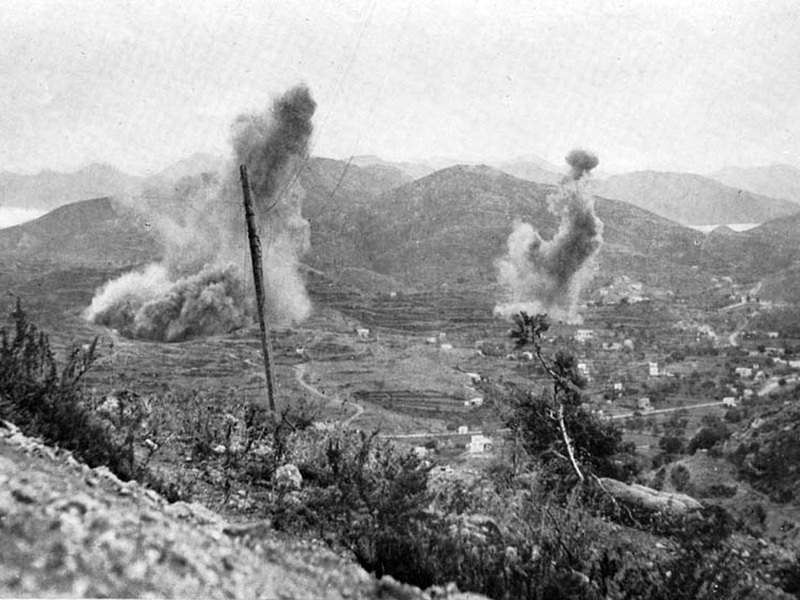 Below are images from the offensive on the Greek Island of Leros, off Crete, November 1943 which led to the death of Hugh Gore-Booth and (when he heard the confirmation after months of uncertainty) of his father Josslyn. 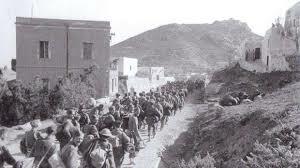 The offensive inspired Alistair MacLean’s famous film “The Guns of Navarone”.